Click image to enlarge Station Camp, near McGowan, Washington. Image taken April 9, 2004. 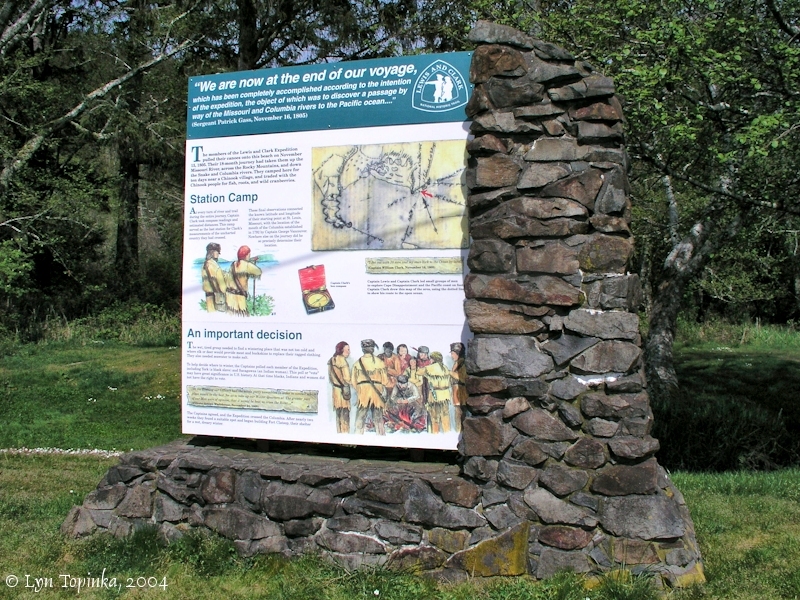 "Station Camp" was located on the Washington shore of the Columbia River at approximately River Mile (RM) 11, just downstream of McGowan, Washington and upstream of Chinook Point, the location of Fort Columbia. 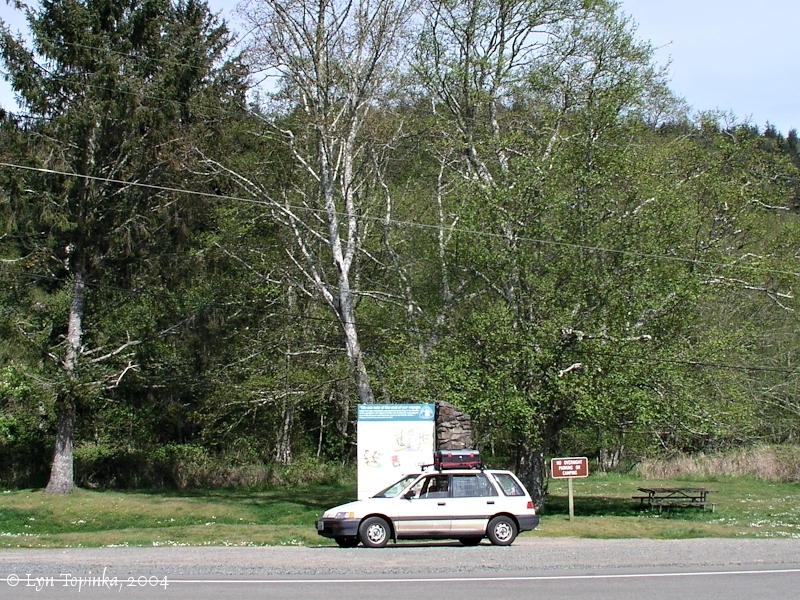 Station Camp was established by Captain Clark and the majority of the men on November 15, 1805, and was located 4 miles downstream of their "Dismal Nitch" campsite near today's Megler Rest Area. To get to Station Camp the men first had to pass the "blustery point" of Point Ellice. Station Camp was located near the site of an abandoned Chinook Indian summer camp. The men used boards from the village for construction of shelters. Station Camp was to be the expedition's main camp for the next 10 days. On November 25 the men moved back to Pillar Rock in order to cross the river. Their goal was to spend the winter on the Oregon side of the Columbia. 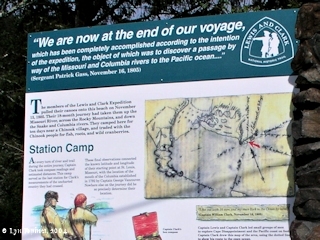 In 2004 Station Camp became part of the Lewis and Clark National and State Historical Parks, a grouping of sites important in the Lewis and Clark story. "This was a clear morning and the wind pretty high. We could see the waves, like small mountains, rolling out in the ocean, and pretty bad in the bay. 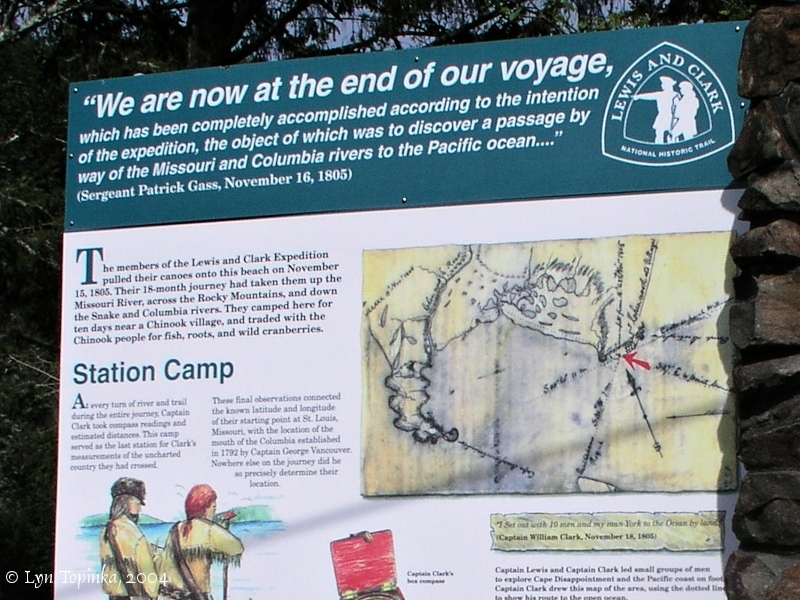 We are now at the end of our voyage, which has been completely accomplished according to the intention of the expedition, the object of which was to discover a passage by the way of the Missouri and Columbia rivers to the Pacifi oceanc; notwithstanding the difficulties, privations and dangers, which we had to encounter, endure and surmount." 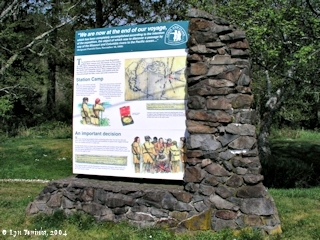 Click image to enlarge Closeup of Sign, Station Camp, near McGowan, Washington. Image taken April 9, 2004. While Captain Clark established "Station Camp", Captain Lewis was on his way to the Pacific Ocean. 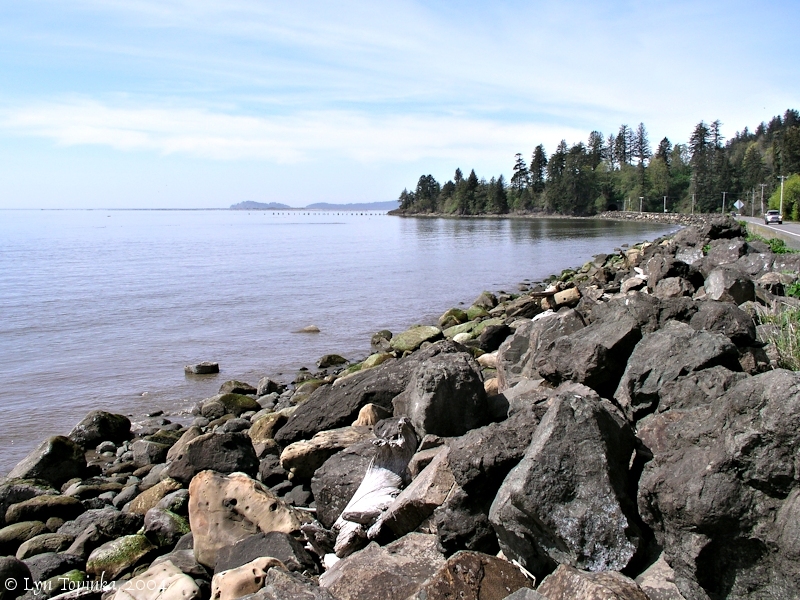 On November 14, 1805, Lewis and four of the men left the "Dismal Nitch" campsite near Megler to explore the rest of the way to the Pacific Ocean. They were hoping to find sea traders in Baker Bay. Lewis and his group of men reached the Pacific on November 15, 1805, near modern-day Seaview, Washington. Meanwhile, Captain Clark and the rest of the men moved four miles from the camp at Megler to what is known today as "Station Camp". Captain Lewis returned to the new camp on November 17 and the next day Captain Clark and 11 men set out for their journey to the Pacific, traveling up the coast as far as Long Beach. They returned to Station Camp on November 20. On November 24, while at Station Camp, the Corps of Discovery took a vote on where to spend the winter. The Oregon side of the Columbia River won the vote and the Lewis and Clark expedition left Station Camp on November 25th, and headed back towards Pillar Rock in order to cross the Columbia at a narrow stretch. The men would end up establishing the winter camp on the banks of the Lewis and Clark River. They would call their winter home Fort Clatsop. "The Corps of Discovery reached the Pacific Ocean after 18 months of arduous travel. With winter rapidly approaching, the party faced a major decision: where to spend the winter. They could remain near the ocean to camp on either side of the Columbia River, or they could travel upstream seeking other sites. On November 24, 1805, Meriwether Lewis and William Clark mustered the group and put the question to a vote. The majority decided to cross to the south side of the Columbia. In this first recorded election in the Pacific Northwest, Clark's slave, York, was allowed to vote -- nearly sixty years before American slaves were emancipated. Sacagawea, the Shoshoni wife of Toussaint Charbonneau, also voted -- more than a century before women or Indians were granted the full rights of citizenship." Source: Information sign, Tansy Point, Oregon, visited September 2009. 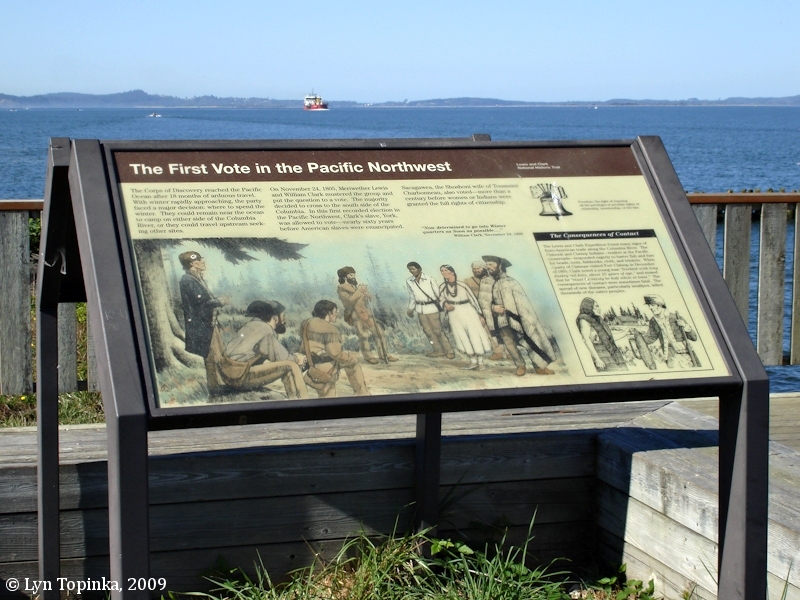 Click image to enlarge "The First Vote in the Pacific Northwest", Information sign, Tansy Point, Oregon. Image taken September 27, 2009. Immediately upstream of Station Camp is McGowan, Washington, where, in 1904 St. Mary's Catholic Church was built. 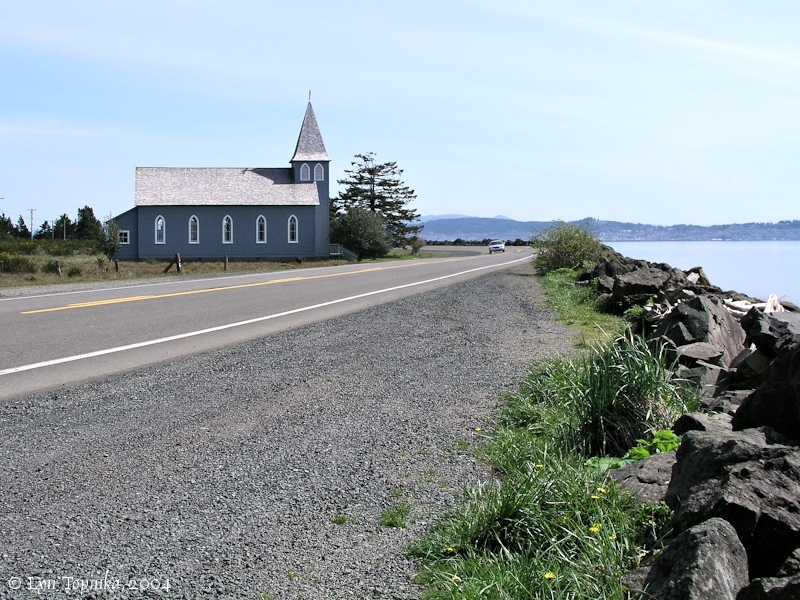 Click image to enlarge St. Mary's Catholic Church, McGowan, Washington. Church as seen from Station Camp. Image taken April 9, 2004. 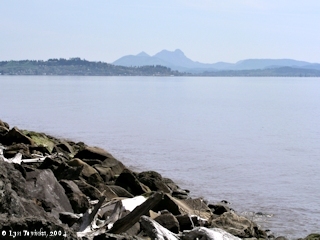 Click image to enlarge Columbia River looking downstream from Station Camp. Looking downstream towards Chinook Point. Cape Disappointment is on the skyline. Image taken April 9, 2004. Click image to enlarge Saddle Mountain, Oregon, from Station Camp, Washington. 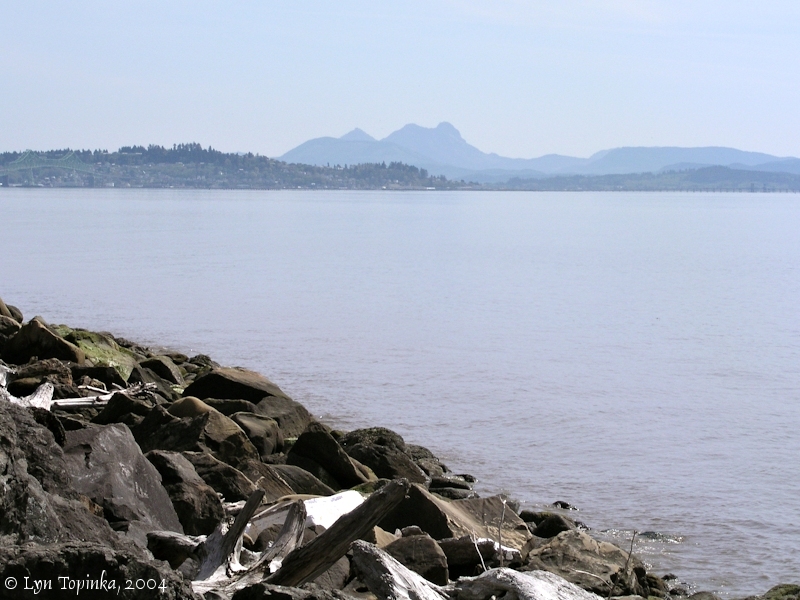 Astoria, Oregon, is along the shoreline, with the Astoria-Megler bridge just visible on the left. Image taken April 9, 2004. This morning the weather appeared to settle and clear off, but the river remained still rough. So we were obliged to continue here until about 1 o'clock, when the weather became more calm, and we loaded and set out from our disagreeable camp [Megler area]; went about 3 miles, when we came to the mouth of the river [Columbia River] , where it empties into a handsome bay [Baker Bay]. Here we halted on a sand beach, formed a comfortable camp [Station Camp], and remained in full view of the ocean, at this time more raging than pacific. One of the two men who first went out came to us here, the other had joined Captain Lewis's party. Last night the Indians had stolen their arms and accoutrements, but restored them on the arrival of Captain Lewis and his men in the morning. a wet morning. about 10 oClock A. M cleared off the after part of the day calm and pleasant we loaded up the canoes and at low tide we Set out and went down about 5 miles passed an old Indian village a little below the clifts passd. Several Small creeks. the country below the clifts is lower and covred with Small timber. 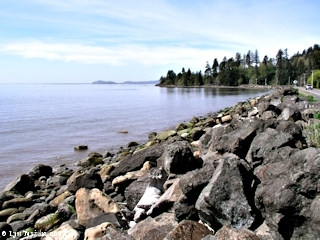 we Camped [Station Camp] in a verry large bay [Baker Bay] on a Sand beach on L. Side [right side ???] . one of the men who went down the River first joined us. Several Indians with him. he informed us that the Savages at the village Stole two of their guns when they were asleep last night, but when Capt. Lewis went to the village they Scared them So that they gave them up again. we took plank from the old village to make us Camps &C.
S 80° W. 2 Miles to a point of a low bottom on the Stard. Side [Station Camp] (where we Encamped 10 days in a narrow bottom Slashey in full view of the Ocian) passed a Small Creek at 1 mile an old Chin nook Village of 36 houses at 1½ miles a butifull Sand beech and narrow bottom below the Creek on Stard. S. 86° W. 11 Miles Computed to Cape Disapointment [Cape Disappointment] the enterance of this great river [Columbia River] into the great Pacific Ocian [Pacific Ocean] a large Sand bar off Point Adams [Point Adams, Oregon]. a Deep bay to the Stard. [Baker Bay] with 2 Creeks falling into it [Chinook River and Wallacut River] and the Coast for a fiew Leagues to the N W Shall be discribed here after.